When the park opened in 1888, it was named Victoria Park. The grounds were originally part of the Grove Estate containing 20 acres of gardens, aviaries, vineries, fishpond, conservatory, and a tennis lawn which became a bowling green when the land was converted into a public park following a contentious issue that took several years to settle. A major proponent of the park was Councillor Austin B. Lines who donated the drinking fountain. The original location of the fountain, known as the Umbrella, was east of the Grove (Park House) across from the bowling green. It was moved to its current location in the 1950s. The canopied drinking fountain is number 21 from Walter Macfarlane’s catalog manufactured at the Saracen Foundry in Glasgow, Scotland. Seated on a two tiered octagonal plinth, the canopy is supported by eight columns with griffin terminals. The highly decorated fret detail arches are trimmed with rope mouldings. Rope moulded roundels contained within each lunette offer shields for memorial. A dedication shield can be seen in old photographs. The remaining lunettes contained cranes. The highly decorated cusped arches are trimmed with rope mouldings which display lunettes with images of a crane and a memorial shield. On each side, arch faceplates provided a flat surface for an inscription using raised metal letters; often the useful monition, Keep The Pavement Dry. Civic virtues such as temperance were often extolled in inscriptions on drinking fountains. The ribbed dome is open filigree decorated with dove and flower relief. The internal capitals are floral ornament, and the internal shields display lion masks. A kylix obelisk finial is at the apex. Doves and flowers offer decorative relief on the circular, open filigree, ribbed dome. The internal capitals contain flowers.. The openwork iron canopy is surmounted with a vase and spiked obelisk finial. Under the canopy stands font casting number 7. The 5 ft 8ins high font is a single decorative pedestal with four pilasters and descending salamander relief supporting a basin 2 ft 6 ins in diameter. The interior surface of the scalloped edge basin is engraved with decorative relief, and a sculptured vase is terminated by the figure of a crane. Four elaborate consoles support drinking cups on chains. All design features in tact. Circa 1967. The fountain is missing and the finial is damaged. Only the canopy remains of the structure. The drinking fountain in the park at the intersection of Tudor and Tudhoe Streets was presented to the Municipality of Wagin in January 1929 by Alexander Galt, an immigrant Scotsman, who operated a hardware importer business in town. The fountain next to Wagin District High School is separated from the park by a white picket fence. The drinking fountain, approximately 2 metres tall, is number 18 manufactured at Walter Macfarlane’s Saracen Foundry in Glasgow, Scotland. The structure is seated on a raised concrete base and canted corner plinth in the form of a St. Andrew’s cross, on which is set a circular shaft, ornamented with water lilies. Four lion jambs support four highly decorated quatrefoil basins. Rising from the centre is a stanchion decorated with alternating swan and crane bas-relief. A kylix-shaped vase terminal with consoles once offered drinking cups suspended by chains. A dedication plaque is located on the base. The fountain which was electronically lighted in 1929, was recorded as a Category 3 historic listing on 15th January 1999. Plumbing was restored in 2008 to operate a chrome tap on the south side. In the mid-19th century, a Temperance group named Band of Hope was founded in Leeds. It was directed towards working class children who were abused and maltreated often due to the effects of alcohol use within the family. From the age of six members were required to take a pledge of total abstinence. The Band of Hope also instilled high moral values to assist them in becoming valuable members of society. Weekly meetings which included lectures and activities were an escape from the poverty and tedium of working class children. 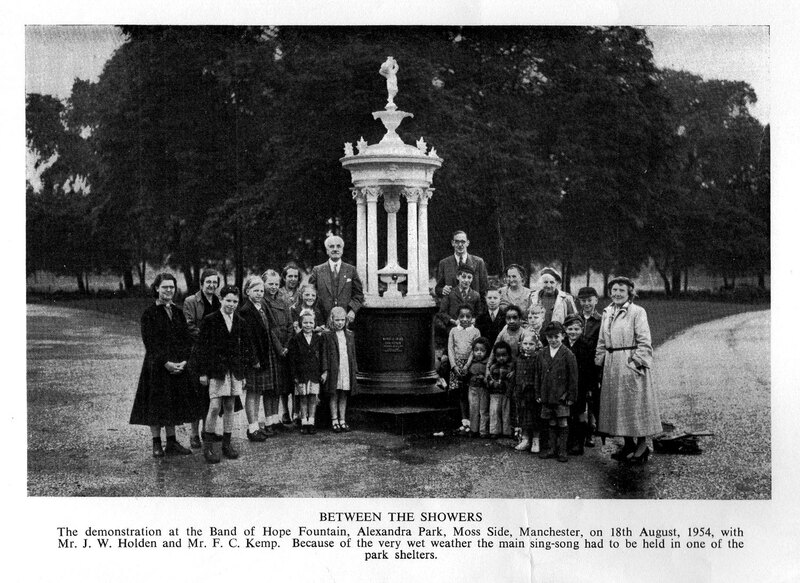 A drinking fountain cast by Andrew Handyside’s Brittania Iron Works was commissioned by the members of 17 Bands of Hope in Chorlton and Hulme. It was erected in Alexandra Park on 23 Sep 1876. Casting number 48 was originally seated on an octagonal plinth with two stone steps to assist the reach of smaller individuals. The cylindrical structure with attic base was comprised of six fluted columns with decorative volutes which support a cupola with Neptune mask frieze and a cornice with leaf detail. The solid dome was surmounted by a sculptured basin and a putto carrying an urn on his shoulder. The original font was an unusual form resembling a capped urn with lion masks spouting water. A dedication plaque was attached to the cylindrical base. In 2012 a planned restoration of the park funded by the Heritage Lottery Fund and Manchester City Corporation included restoring the fountain which retained little of the original design elements: the putto was missing, corrosion had caused the domed roof to collapse, the font was broken, and the structure had been tagged with graffiti. Heritage Project Contracts, specializing in cultural heritage and historic buildings, utilized blast cleaning to remove decades of paint and rust. Hargreaves Foundry of Halifax was hired to recreate missing elements from photographs. The restoration was completed in September 2014. The Sele drinking fountain is located within 250m of the principal entrance of Hexham Park. The fountain, erected in September 1899, was commissioned by the Abbey Church of England Temperance Society. Although recorded as a Grade II historic building on 18 May 1976, the structure was vandalized; griffin sculptures were removed and the crane which stood in the centre of the font disappeared. It was later reproduced by Dorothea Restorations in 1993. In 2013 an evaluation of the fountain by Lost Art Limited revealed evidence of deterioration in the cast iron structure and that several parts of the original structure were missing. It was dismantled in 2015 for restoration funded by the Northumberland County Council. Drinking fountain number 8 from Walter Macfarlane & Co.’s catalogue is 9 feet 6 inches high and was manufactured at the Saracen Foundry at Possilpark in Glasgow. The structure is 9 feet 6 inches high and consists of four columns, from the capitals of which consoles with griffin terminals unite with arches formed of decorated mouldings. Rope moulded cartouches contained within each lunette host the image of a crane. On two of the sides provision was made for receiving an inscription using raised metal letters; whilst on the other two sides was the useful monition, Keep the pavement dry. Civic virtues such as temperance were often extolled in inscriptions on drinking fountains. The structure is surmounted by an open filigree dome. The short post appears to be the remnant pillar of a lantern, the missing the finial. Under the canopy stands the font (design number 7), 5 foot 8 inches high. The basin which has a scalloped edge and decorative relief is supported by a single decorative pedestal with four pilasters and four descending salamanders, a symbol of courage and bravery. A central urn with four consoles offer drinking cups suspended by chains. The terminal is a crane. In the 18th century the Royal Burgh of Kirkwall had exclusive foreign trading rights preventing Stromness to trade abroad. Alexander Graham, a 18th century merchant, led the successful revolt which reversed this monopoly. He is commemorated on a drinking fountain located on Victoria Street at Pierhead. It was erected in 1901 to honour his efforts. The 18 ft. drinking fountain was casting #27 manufactured by Walter Macfarlane & Co. at the Saracen Foundry, Glasgow. The design was well suited for Street Crossings, Squares, Market Places, etc., as it afforded drinking accommodation for a large number of horses and drivers, and effectively lit a wide space, with the least possible obstruction to other traffic. The structure provided a drinking trough for horses with a small recessed basin for dogs at ground level. The trough was a circular cast iron basin supported on legs in the form of horses’ hooves. 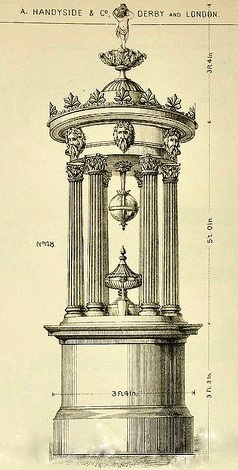 A central fluted column was capped with a hexagonal lantern with scales of opal glass that cast the light downwards (design number 223).The lantern has changed throughout the centuries with advances in lighting. Originally and now missing, were four projecting consoles which suspended cups to allow humans to drink from the spouting water whilst horses drank from the large basin. One of 4 horse fetlocks supporting the structure.